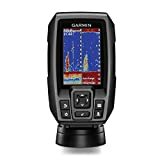 If you need an affordable unit which is small, then the Garmin 010-01550-00 Striker 4 Bbuilt-in GPS Fish Finder is a perfect choice. This unit offers a CHIRP sonar for better imaging. You can mark the hotspots as well as the not-to-go places for future. Finding a fish which is below your boat is quite easy if you are using the Garmin Striker 4 Fish Finder with built-in GPS for this purpose. Now mark the hotspots and return to them when needed. Share your waypoints with the friends. Now experience uninterrupted and clear imaging. Look at your sonar images from the past that you missed. All these features are provided in Striker 4 which will give you a whole new experience of finding a fish and exploring it in detail. A small portable unit but high efficient with perfect features. There is a transducer included in the Garmin Striker 4 with a 4-pin connector. There are two beams used b it at 15 degrees and 45 degrees. For scanning higher depths, 50/200 kHz transducer can also be used. This unit is capable of High CHIRP and Mid CHIRP, and low CHIRP option is not available. The maximum depth which is offered by this unit is 1600 ft. When you are fishing in freshwater, and for seawater, it is 750 ft. CHIRP sonar is added in this unit which gives you more clarity. You can define the target in a better way if you are using this unit. Split screen feature and temperature alarm are also added in the unit. A flasher mode is a newly added feature which helps you out in dealing with the targets that sonar beams caught. Flasher’s inner rings are for determining depth while the outer rings are for indicating a strength of sonar returns. Auto Gain feature is another booster which allows you to eliminate the unwanted noise automatically. When the boat speed is high, Ultrascroll enables the data of sonar to scroll quickly. It is equipped with 3.5 inches with built-in GPS. The keypad is easy to use. The software is easy to update for better performance. Fish Symbol ID is also a part of this unit which helps you out in receiving sonar returns. Reviewing a sonar is also an easy task that you forgot in the past. Mark the target and look at it in depth. Offers you two frequencies so that you can get the best results. No matter you will have to purchase a unit cover or NMEA connectivity is not provided, but other features make it a better option.